If you are one of those lucky metropolitan area CATV systems, which established direct fiber connection to the major TV studios, no need to worry about over-the-air HDTV reception catastrophic failures caused by the digital cliff. When analog signal reception degrades, due to fading or inclement weather conditions, analog pictures gradually develop a noisy background. DTV signals react differently. When the DTV signal level drops below the minimum threshold, HDTV pictures just break up or totally disappear. In a nutshell that is the digital cliff effect. In case the system’s antenna site is far away from the desired DTV station, beyond line-of-sight of the transmitting antenna, or outside of the “radio horizon range”, the reception can be exposed to the Digital Cliff affect if no precautionary steps were taken. In other words, distance is a critical reception parameter, affecting the received signal level. Where R is the RHR distance in miles, while ht and hr are the heights of the transmitting and receiving antennas in feet. The desired DTV station: Channel 56. WTVF-DT, Nashville, Tn. has a transmit antenna height of 787’ Above Average Terrain. The computer developed Signal Direction Sheet displayed the exact distance (67.86 miles) and direction (304.5° ) of the DTV station. Would a 200 ft receiving antenna height satisfy radio horizon range requirements? The 67.86 miles station distance missed the RHR limit by 8.38 miles. The Radio Horizon Range criteria is still not satisfied, despite the significantly increased tower height. 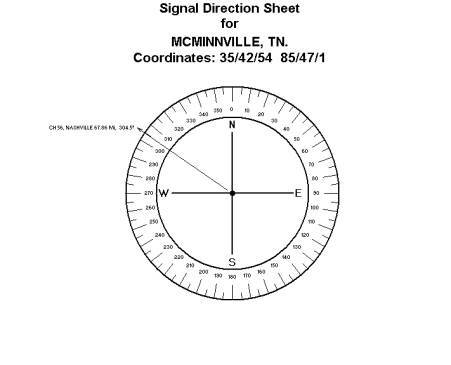 The computer developed Signal Direction Sheet showed the distance of Channel 56, Nashville, as 53.87 miles, the direction as 325.7° Azimuth. Would the installation of a 75’ pole satisfy the radio horizon range envelope? The 53.87 mile actual distance came close to the desired RHR, but still missing the target by about 2 miles. The 150’ antenna height ascertained a 2.95 mile safety factor. Of course the terrain toward Nashville, Tn. is not perfectly flat, as shown on the topographic map below. 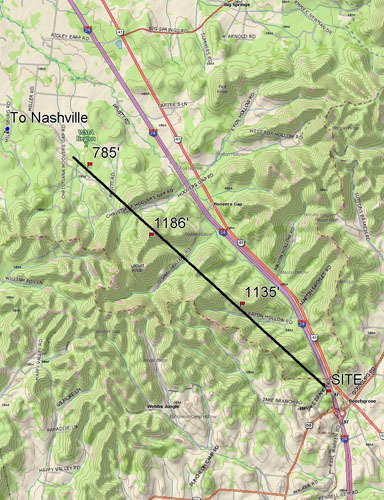 While the elevation of the proposed Beechgrove site is 920 ft Above Sea Level, observe the 1135 ft and 1186 ft obstructions into the Nashville direction. Obviously, these terrain characteristics will affect the amplitude of the received DTV signal. There is no DTV reception study which could properly take into account the height and shape of the hills, reflectivity of the ground, the height of the trees, the density of the forest, etc. Computer calculated DTV signal levels are based on flat terrain, average conductivity, omnidirectional transmit antenna radiation patterns and fair weather conditions. How many sites qualify for all these assumptions? The computer cannot be programmed for local interference, such as electrical (AC) interference generated by high voltage power lines, or RF interference, caused by mobile radios, harmonics of broadcast stations, vehicular traffic, etc, nor can the computer predict the presence or absence of reflections (ghosting), a real HDTV picture quality killer. Only a professionally conducted on-site DTV reception verification testing will deliver conclusive test results, assisting the survey engineer in making the proper antenna tower height and antenna-array recommendations. An ideal verification survey should use a 150 ft high telescopic mast, a rotor-mounted 6’ diameter parabolic antenna on top of the mast, accompanied by a full week of on-site testing to obtain data during inclement weather conditions, with hourly readings 12 hours a day. Of course this time consuming and expensive arrangement would be unacceptable for management. 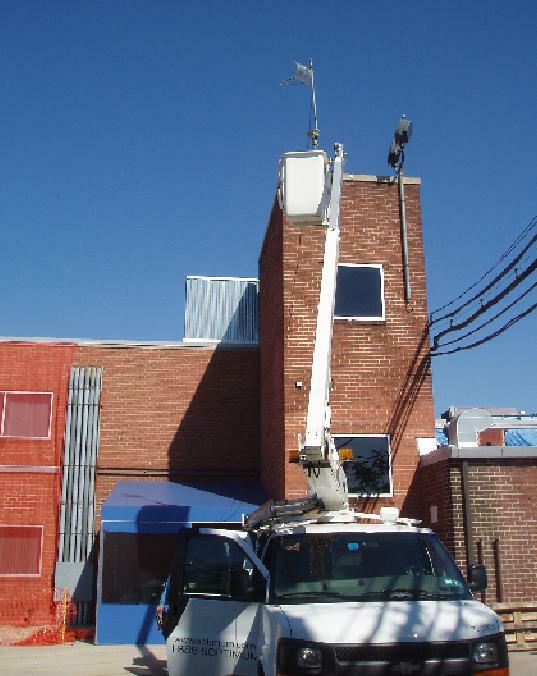 A well conducted DTV reception verification survey would use a bucket truck, with rotor-mounted test antenna elevated to 35 ft above ground. The most desirable time for conducting a DTV reception survey is at mid-day, particularly 1:00 to 3:00 PM, when the signal path from the distant UHF station may be broken by heat turbulence and ascending warm layers. This does not mean that surveys conducted on a foggy or rainy day are of no value, but early afternoon hours represent the most favorable testing time under any conditions. Almost all distant UHF stations exhibit variable fades between 1:00 and 5:00 PM, with maximum depth of fade occurring around 3:00 PM. Rotor-mounted, high-gain, high directivity antenna (Radio Shack antennas no need to apply). Low-loss coaxial cable connecting the antenna with the instrumentation. High quality spectrum analyzer, digital camera with close-up lens. Professional quality HDTV tuner and large screen TV/VCR combo. Computer Run and Signal Direction Sheets, to warn the survey engineer about reception difficulties, such as low output power, low transmit antenna height and potential adjacent/co-channel interference difficulties. 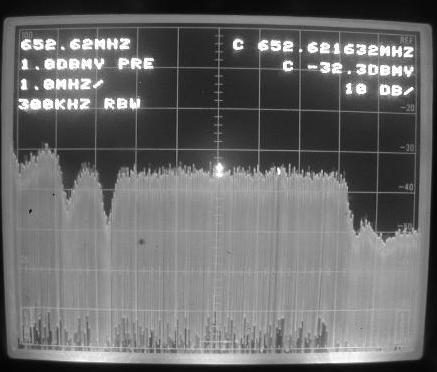 Every conventional, high quality spectrum analyzer can be used to measure DTV signal levels, but a certain bandwidth compensation must be taken into account. In DTV transmissions the RF power is evenly distributed over a 5.5. MHz wide spectrum, versus the analog mode, where 98% of the RF power is concentrated in the narrow video carrier. higher then displayed on the screen of the instrument. In the above sample the -32.3 dBmV readout on the analyzer’s screen is equivalent to -20 dBmV signal level, obtained under ideal weather conditions. There are no firm recommendations in the technical literature for minimum acceptale DTV signal levels. The FCC suggests -61 dBm, equivalent to -12.2 dBmV, for minimum must-carry signal levels. In the opinion of this consulting engineer, a -10 dBmV reading would ascertain a reasonable safety factor against digital cliffs.